This is the version three iteration of the SparkFun Inventor's Kit (SIK) Carrying Case. This spiffy carrying case was designed by our very own Ministry of Machines (designer of the S.H.O.V.E.L.) 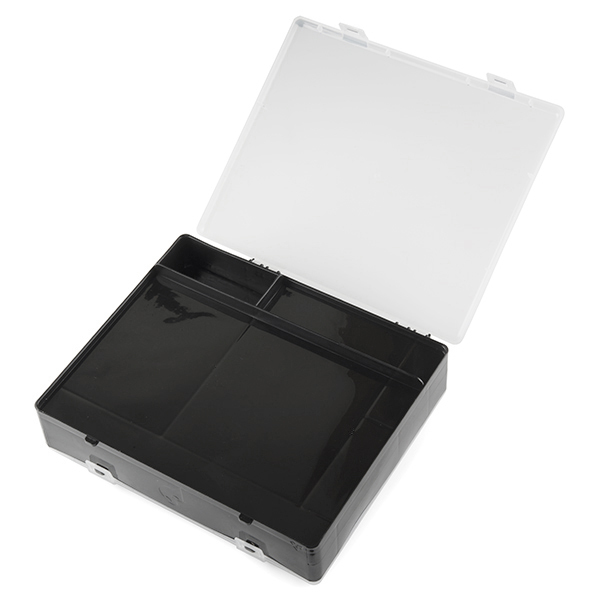 and features seven separate compartments under a translucent snap-in latch lid. 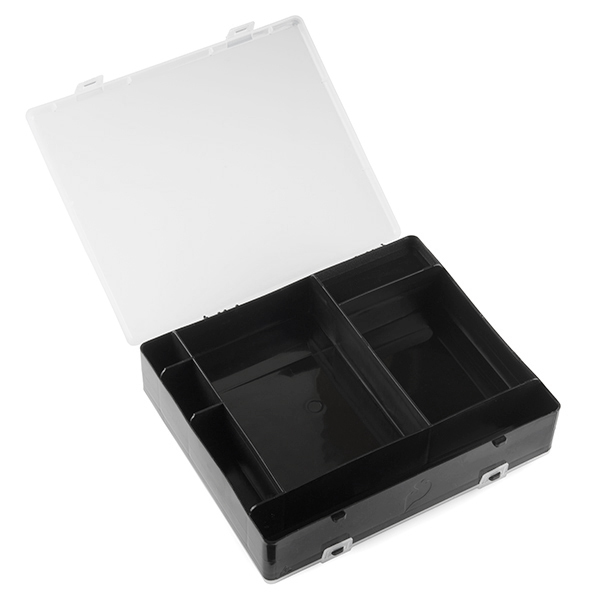 The underside of the box has a translucent snap-in latch lid as well, with an additional three compartments, where you can put user manuals, documents, and even more parts! Can this fit inside the new HDPE Case? 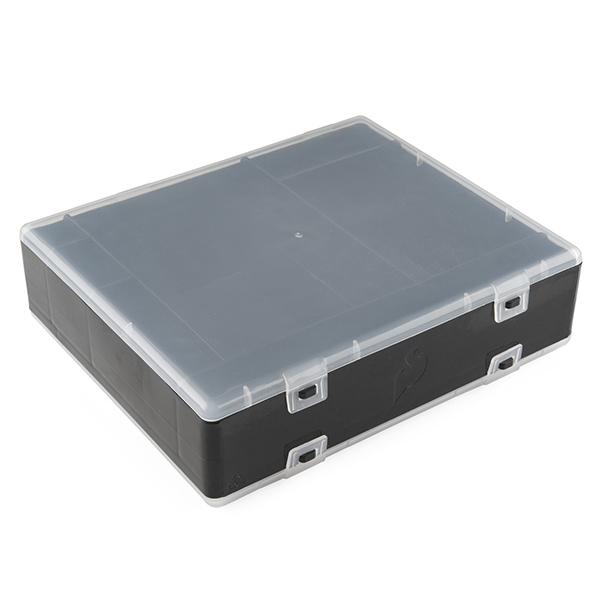 Can this box hold the adjustable parts box inside? Is this plastic antistatic too? Static tests with my uncalibrated cat were inconclusive, however the measured surface resistivity is greater than 100 MOhms, so it's not antistatic or dissipative type plastic. Not shown in the dimensional drawing, the compartment depths are 1.73" (front) and 0.5" (back). The lids fit well, but could allow tiny (e.g. SMT) parts to escape. This is a great case; the only improvement I can think of would be to add a fold-down style carrying handle. This well organized box has places for cables, a book, some note cards, some custom test parts, and other components. You get a set of well thought out compartments on both sides that are actually supposed to hold parts for the Sparkfun Inventor's kit. It does that very well according to my Ham Radio friend. The thing of it is that the SIK also does will with test equipment, the current project, and sound tech gear. Another reviewer thought this case needs a handle. I'm not so sure. I stuff mine into a back pack or tool box to work with my Boy Scouts. Si I like it the way it is. Recommended. I plan to use this on the trail so it'll need some modification. I'll put some fasteners (probably Velcro) in the bottom and cut some notches in the upper edges of the dividers to let wires cross between compartments. Then it'll be perfect. The whole thing is sturdy and well made and the compartments seem to be the right sizes and numbers for my Arduino setup.